Contrary to popular belief that increased lending, first in the financial and corporate sector and then on a country level, is the key source of Europe’s problems, it turns out that this may be just the tip of the iceberg in a series of many structural problems, namely: reduced global influence, low growth, population ageing, reduced competitiveness against developing countries, increasing energy dependency, and loose coordination among participating countries. Overall, Europe is quickly losing momentum in the global economy, as it becomes more and more “yesterday’s news”. However, the solution may exist in what we call the “large” Europe scenario. *This post has also been published, in an adapted form, in a recent issue of the GeoPolitica journal (http://www.geopolitic.ro). You can download the full article here. Evidence in favour of our “Large Europe” scenario is coming from everywhere! Following the admission of IMF’s officials of the errors involved in the estimation of the impact of the austerity measures to the Greek economy and the recent IMF mea culpa, now, the EU political leadership is moving towards the "large" Europe scenario, described in this discussion, involving less austerity and more growth initiatives. First, Schauble argues in favour of a multi-billion stimulus to boost growth in the European South. And then Barroso urges EU leaders to be more bold on so-called structural reforms that can deliver growth and jobs. He also underlined the need to spend smarter on research and innovation, also a key recommendation of our “Large Europe” scenario. European Council’s President, Herman Van Rompuy, in his keynote opening speech at the European Business Summit 2013, also mentions many of the recommendations of the “Large Europe” scenario, including the need to focus on growth initiatives, competitiveness, and selected high potential areas like the energy sector. Admittedly, all these are easier said than done; however, this is definitely a start towards a different direction with more focus on development and growth. Yes, Europeis growing old. Many of its better educated consumers are on the whole comfortably established and afraid of losing their purchasing power. Many of its youth are poorly educated and agriculture no longer provides a lifeboat for those who have fewer qualifications. The best way out of urban poverty is drug dealing for many. We haven't got a properly 21st century culture as yet, and there is no clear way ahead for those who are still tied to the thoughts of the previous two centuries, basically these are clockwork and what daddy did. I think Europe is involved now in a much more important project which exceeds the others, meaning to integrate its eastern countries and make the Europe federalization, so its most energy is directed to this target. It is not a weakness but a consolidation, and this will have a bigger positive impact to its global influence in the future. 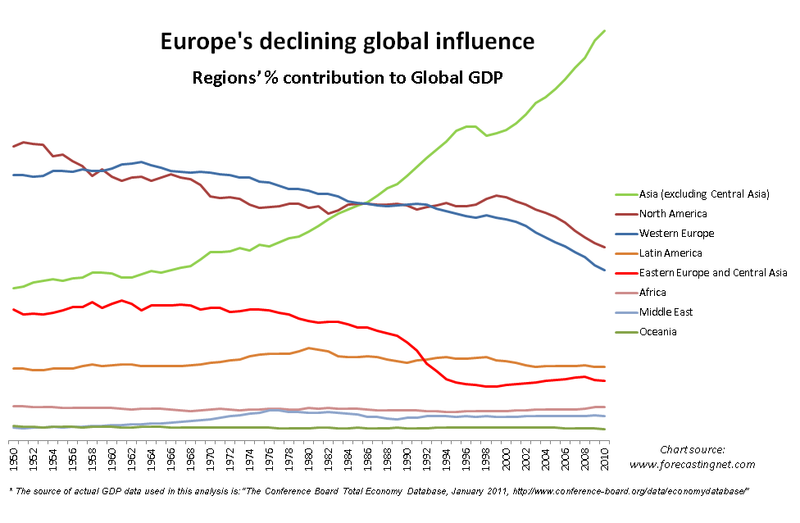 Isn't the degree of influence exerted by the USA declining at a similar rate to that of Europe [albeit from a higher base] since about 2000 [at least that's what the chart shows]. Your comments seem somewhat selective. Sounds like you are a fan of Hollande's policies. Lets review some of these: reduction of retirement age to 60, announcement of huge taxes on large incomes, additional spending on welfare programs. It is beyond me, how chasing capital out of the country and burning money in hayfires will lead to a more stable Europe. In the long run, the only thing that will help is balancing budgets or increasing inflation rates. This will, I'm afraid to say, also mean to stop redistributing money from tax payers to overinflated banks and a return to the "no bail out" policy for defaulting countries. It illustrates the increased Bank leverage in U.K. and makes a comparison to previous recessions. You can find similar data for other advanced economies elsewhere. With such increased levels of leveraging it shouldn't be a surprise that a debt crisis would be triggered sometime in the future, regardless of what smaller economies like the ones that now participate in the bailout program would do to avoid it. And again leveraging was not the cause of our problems but a merely a catalyst leading first, to increased growth based on false expectations and then to a sharp decline of wealth and economic activity everywhere in the world. The key issue at that time was that we expected more growth and innovation from the economy than it could produce and we had the money supply to fund our false dreams. Today, the problem is quite the opposite. We expect next to nothing from the economy, and we don't have the money to fund even our day to day needs. And surely, we don't have the money for investments even if these are well justified. The aforementioned vicious cycle, triggered after the collapse of the Lehman Brothers led step by step to the decline of all economies around the world. The less equipped was the economy, i.e. the less competitive it was in both terms of creativity and efficiency the more likely it was to face a default. It proved that the EU was not so strong as everyone thought, in my mind, because of the still addressed structural problems it faces, i.e. reduced global influence, low growth, population ageing, reduced competitiveness against developing countries, increasing energy dependency, and loose coordination among participating countries. So, again, what surfaced to some countries was just a symptom of disease spreading all over the world, including Europe. If we are to fight this disease we need much more than to balance our public finances! Among other things, Krugman argues that austerity measures derailed recovery in Europe and elsewhere. He identifies the European bailout programs, starting with Greece, as the Big Fail as Europe put more effort to balance public finances where more stimulus was needed to recover the economy. If you think about it this is the same dilemma we faced in this discussion i.e. a risky expansion (the large Europe scenario) vs. slow death (the tidy Europe scenario). Apparently, Krugman is in favour of less austerity-more stimulus oriented solutions, as our large Europe scenario suggests. But even if stimulus is the right way to move forward, there is one more thing to consider. Stimulus should not be unfocused. It should be targeted to address specific structural problems-as the decreasing competitiveness or the ageing problem-and/or exploit emerging opportunities-as the energy sector, for instance. Take the recent bailout of Cyprus. The way European leaders handled this delicate situation was a disaster. Not only, the economy of Cyprus took a major hit but also the overall financial system in Europe did as trust reached a minimum in fear of bank deposits losses. Furthermore, recent events triggered a conflict regarding Cyprus newly found energy sources. Again the issue of energy, mentioned in The future of Europe report, appeared threatening to destabilized geopolitical balance in the territory involving the EU, Russia, Turkey, Israel, Greece, and Cyprus. In my mind, none of these would have happened if the EU had already agreed with Cyprus to coinvest in exploiting the new energy sources, in return for help to rescue its banks. That would also help reduce EU's energy dependency and avoid a major geopolitical imbalance in the area. Obviously, this is easier said than done, however, I believe it is in the right direction involving effective cooperation in the EU and investing in a promising market instead of another dubious bailout.